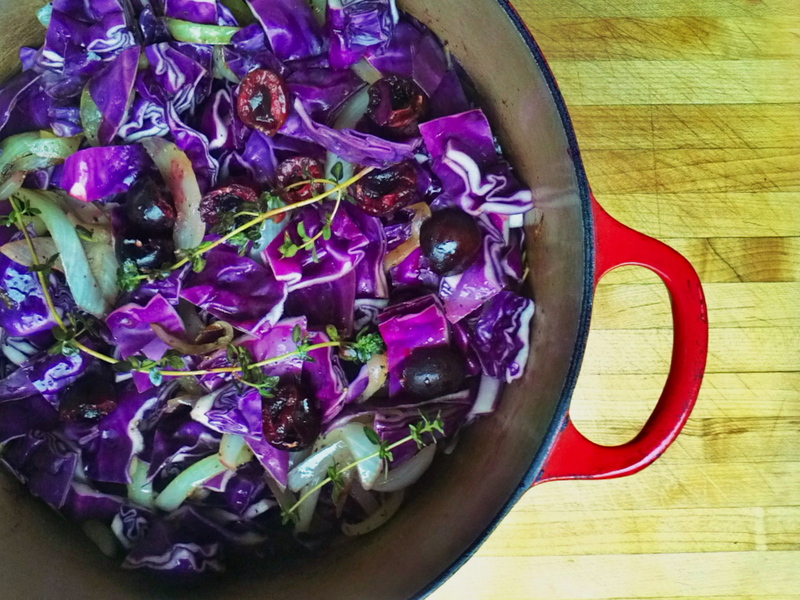 This sweet and tangy braised cabbage has become a favorite recipe at our house. I don’t think I would have ever thought to make cooked cabbage if it wasn’t for my dear friend Katrina. Her mother was German and Katrina learned to love this dish growing up. She came to visit me when I lived in Chicago one year at Thanksgiving and made this for a side dish. I was so impressed with it – it really is a perfect side dish for a rich dinner of roasted meat. It’s got some sweetness from the caramelization of the onions and the cabbage, and it has this wonderful tartness from the vinegar. These days we often use it as a side dish when we eat our weekly dose of beef liver. It really cuts the sometimes too-rich flavor of the liver (at least for me – my husband could eat the stuff with just a little salt and pepper). Katrina makes her version with an apple, and it’s perfect. Today I made mine with cherries just because they happen to be in season. I think it would also be great with dried fruit – apricots or figs in particular. Warm a large, heavy-bottomed pot over medium heat (cast iron is great). Melt the fat in the pot and add the onions, seasoning them with plenty of salt and pepper. Sauté the onions, stirring often, until just starting to brown, about 5 minutes. Add the chopped cabbage, breaking apart as you go, along with the apple or cherries. Stir well to coat the cabbage with the fat. Lastly, add the thyme sprigs, wine, and vinegar. Cover and reduce the heat to medium low. Allow the cabbage to cook for 50-60 minutes, stirring every 10 minutes or so to prevent sticking. You will likely have to reduce the heat further once most of the liquid evaporates. The cabbage will be a deep, rich color and meltingly tender when it is ready. Add more vinegar and salt to taste if necessary and remove the thyme stems before serving. This entry was posted in gluten free, paleo, perfect health diet, vegetarian and tagged gluten free, paleo, perfect health diet, vegetarian. Bookmark the permalink.